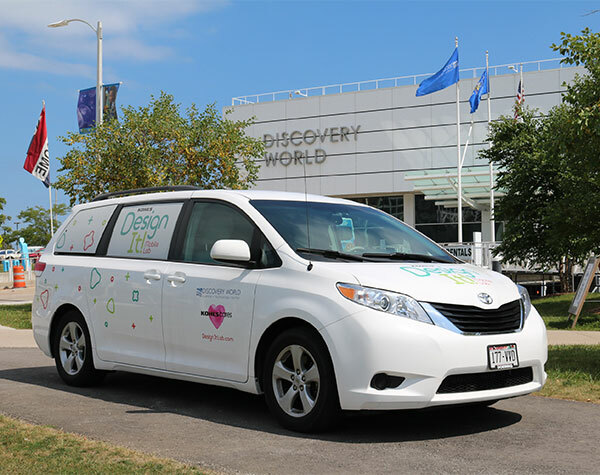 Let Discovery World take over your classroom with the Kohl’s Design It! Mobile Lab! Includes two Educators and all supplies! A mileage fee of $0.50 cents per mile (each way) will apply. Maximum distance we will travel is 30 miles from Discovery World. *A school’s Economically Disadvantaged status is determined from the Department of Public Instruction’s (DPI) School Report cards for the most recent school year. If your school does not report this information to DPI, you must provide proof of your school’s status at the time of reservation. For more information or to book the Kohl’s Design It! Mobile Lab, please fill out the form below or call our Kohl’s Design It! Lab Program Manager, Darius Jordan, at 414.274.4202 or email djordan@discoveryworld.org.